The location and size of the proposed KGHM Ajax mine poses a possible threat to the health of the residents of Kamloops and Knutsford, and the ranchers living outside the city, close to the mine site. The City of Kamloops is located directly below and downwind of the proposed Ajax mine. The pit itself is about 1.3 km from the urban growth boundary. It is unrealistic to hope that this massive project will have no negative health impact on the city. Consider the following facts. There are 8 elementary schools, 4 high schools, 4 seniors residences, one hospital and one university within 6 kilometres of the mine property. Pacific Way Elementary School and some houses are only 2.2 kilometres from the mine property. Dust from two huge waste rock facilities plus the dust created by the open pit mining operation may be blown by the prevailing southwest wind directly over the schools, the houses of Aberdeen and Pineview Valley, and then over the city. Thermal inversion, common to Kamloops, would then keep the dust there. The combination of dust, noise and vibration can and probably will adversely affect people's health. It is in this context that potential threats to the health of both rural and city residents must be properly addressed. What are the health risks, and who would be most at risk? Dust is the principal threat to air quality. As in any population of 80 to 90,000 people, residents most at risk are those who have environmental sensitivities or who have respiratory diseases, as well as the aged and the young, two very susceptible groups. 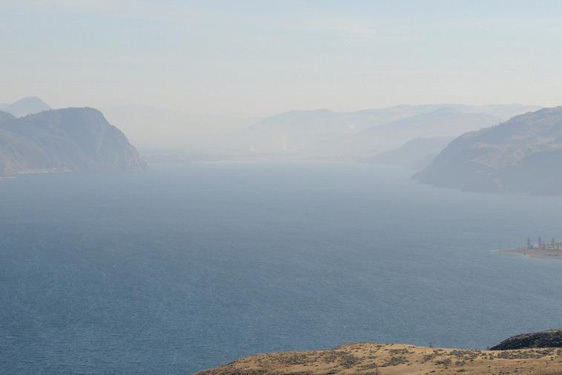 Air quality is already a problem in Kamloops due to the all too frequent thermal inversion. Wind-borne dust, some of which will be so fine as to be invisible, as well as blasting gases, will be carried over the city, adding to the burden of contaminated air emitted by Domtar. The issue of air quality constitutes a real threat to many people and cannot be lightly dismissed. The Kamloops Physicians for a Healthy Environment has produced a great brochure that covers a lot of potential health risks of this mine, and it includes references as well. Click here to download it and share with your friends. The BC Public Health Officer's Annual Report of 2003 (phoannual2003pres.pdf) clearly identifies dust as a health hazard. The BC government web site on air quality also stresses the hazards presented by polluted air. (http://www.bcairquality.ca/health/index.html). The Health Canada web site on the health effects of air pollution, (http://www.hc-sc.gc.ca/ewh-semt/air/out-ext/effe/health_effects-effets_sante-eng.php), explains how air pollution can cause serious adverse health effects. The BPEM Dust Control Study (BPEMDustControl.pdf) states in the Foreword that dust is an inevitable problem with mining operations. Problems that are multiplied in arid climates - such as we experience in Kamloops. The noise generated by the mine will be substantial, 24 hours per day, 365 days per year. Noise can affect those exposed to it quite significantly. It is intrusive, annoying, and can be very stressful when it is constant, as would be the case with Ajax. Stress carries with it associated mental health problems. And there will be no escaping the noise for those who live less than a kilometre away from the mine. By-Law 24-42 4. (a) "No person shall make or cause, or permit to be made or caused, any noise in or on any public or private place which is liable to disturb the quiet, peace, rest, enjoyment, comfort or convenience of individuals or the public." This raises an interesting question. If the mine goes ahead, will the Noise Control by-law be enforced if there are complaints from residents of Aberdeen of noise emanating from the mine? Vibration from blasting will possibly be felt by the residents closest to the mine. As is the case with noise, some will find it both disturbing and worrying. Concerns over the possible damage to property (cracked basements), water lines and so forth will prove very stressful to many people. The proposed KGHM Ajax mine is far too close to the residents of Kamloops and to the ranchers to the south and west of the proposed mine. In that context, the KGHM Ajax mine should not be developed without first having a completely independent assessment of all health risks, conducted by properly qualified panelists. KGHM should provide full substantiation for their position that the mine constitutes no health risk to either the ranchers south of the proposed mine, or the residents of Kamloops and Knutsford. Better yet, there should be an independent assessment of potential health risks in the form of a federal Review Panel. Particulate matter shown over Kamloops in this photo is generated by Domtar, cars, houses, and other pollutants in Kamloops. The mine will substantially add to this, and can potentially include toxic materials and chemicals.